Just when I thought I had figured out the pattern and common elements of the Tombs Series by Cryo Chamber, Tomb of Druids came along and blew me away. There is no doubt for me that this is the best Tombs Series collaboration/compilation to-date. The extensive and bold use of field recordings throughout this album gives it a huge edge over the previous Tombs Series releases. The use in the foreground of field recordings on this one gives the entirety of the album a smoothness and consistency that was only touched upon in the past. It feels like one neatly flowing experience for the 50+ minute duration of the album. Of course, each artist certainly brings their own flavor to the album. Each set of drones differs, each use of vocal elements, instrumentation or even the movement sounds (walking, placing items on a table) is a little different from the one before. But I get the feeling that some of these field recordings were all from a single source and shared amongst the musicians to help create this synchronization of sounds. The cover art looks to depict a human sacrifice. Robed and laureled figures stand in the foreground, the bearded male carrying a knife and the stern but beautiful female gazing into the distance. Between and behind them lies their human victim, spread on a table, head dangling lifelessly over the edge. The sacrifice is complete and the druids look to the distant stormy skies for signs of the Gods’ acceptance of their offering. protoU delivers the opening, and one of the longest tracks, on the album. From the very beginning we are overwhelmed with thick and intense uses of field recordings that protoU has hinted at in the past, but never used so boldly. The outcome is pure excellence. This is the sort of dark, stormy, cryptic field recording laden cinematic dark ambient for which I constantly am searching. The mastering by Simon Heath, the man behind Sabled Sun, surely helped to give these cinematics a full and proper edge, taking them even further toward her goal than she likely would have imagined. While their is plenty going on musically on “Eyes of the Shaman”, in terms of drones, these field recordings are rightly the main and focused element of the track. We can only hope for more of this sort of sound in the future for protoU. 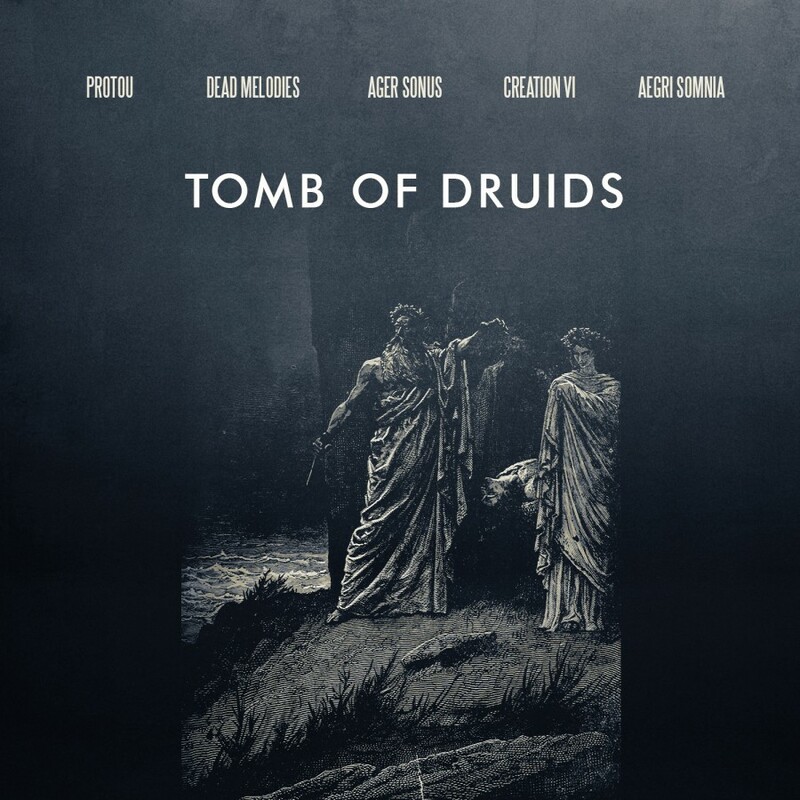 On the following track, “Temple of Druids” by Aegri Somnia, the thunder storm field recordings continue from the protoU track, but enter later in this one. It initially begins with deep crushing drones, intricate field recordings of movements, ritual incantations, a haunted choral/drone section, and other oscillating drones which all combine to add a depth to the psychological effect on the listener, bringing us into the rituals. Distant chants, toward the end of the track, along with the thunder storm kicking in bring the whole experience to a new level of emotion. Dead Melodies decided to name their track, “Bryn Celli Ddu” which means the mound in the dark grove, after a specific prehistoric site on the Welsh island of Anglesey, dating to the neolithic period, some 17,000 years ago. So we can have a hint from this title at the sort of extent to which this whole album depicts a scene that is long lost and forgotten, tombs that are slowly being erased from history by the constant movements and destruction of modern humanity. The track evokes strong vibes of this period with the use of what sounds at times like the clashing of rocks or wood tools and/or ritual paraphernalia, sounds that continue through later tracks along with the storms. Lush guitar drones build the foundation along with these field recordings of dripping waters as if the rains here had just ended. The drones continue to thicken and become more menacing as the track progresses. Ager Sonus‘ track begins with campfire field recordings. Deep drones fade in and out of the mix, leaving only the fire as the foundation. A lonely flute-like instrument or synth, and later the ensemble of stringed instruments cut through the mix giving it a dreamy and melancholic sort of feel as the field recordings of movement, dripping waters and distant storms all come together making the experience vivid and highly enjoyable. This is not at all the Ager Sonus we know from their Cryo Chamber debut several months back, giving plenty of room for hope that their next album will be equally enjoyable in a totally different way. The track ends with the recurrence of the thundering storm moving to the foreground as the drones fade out. Creation VI starts his track with some highly manipulated chanting, that quickly brings to mind old raison d’être, even more so than on the previous Metatron Omega releases in which I’ve made this sort of comparison. Something that sounds like a cross between muted picking of a guitar or tapping on a drum with heavy delay oscillates between speakers as a hollow airy drone starts to move into the background. These manipulated vocals slowly fade out or shift into another sound that continues to move in the background. As the drones become extremely thick and prominent, field recordings occasionally cut through the wall of sound, rocks bashing on rocks, also oscillating between speakers, as many elements of this album have done. Toward the end of the track the deep voiced incantations similar to those of the Aegri Somnia track resurface, adding what ends up being a chilling sort of vibe to the soundscape, even if it’s not intended as some shocking or haunting content. Tomb of Druids is an absolute success. When I saw that it incorporated all new artist that had never participated in the series previously, with one track each, I was hesitant about how well it would work out. But after a number of listens, it’s absolutely clear that this album is worthy of the Tombs Series and, as I’ve previously mentioned, it is likely the most successful at extracting the correct psychological and perceptive responses from listeners. At this point the series could move in any direction. Taking it into these ritual grounds is certainly an interesting path and one that continuing to follow would likely bring about even more levels of success. Highly recommended for the cinematic and ritual ambient listeners.